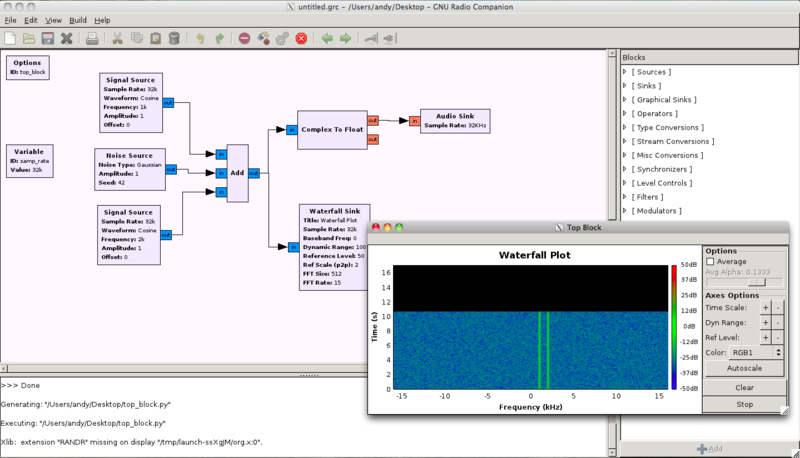 After a little effort, I got gnuradio running under OSX with MacPorts. Thankfully, there is a fairly nice package in macports which contains most of the dependencies needed to install everything for gnuradio. Unfortunately, the most recent version of sdcc is not compatible with usrp. So, to install gnuradio, you need to first install an older version of sdcc. The following is what I did. This bug report contains more information about this work around. Once you’ve installed everything, you need to setup your paths as described in OZ9AEC’s blog post. He suggests modifying the global python path to point to the one installed by macports. This is done by adding the following line to your .profile. This works, and so far I haven’t run into any problems with other python applications but, I should really modify gnuradio to point to the correct path not the entire system. After installing it, I put together a quick test setup with a few audio sources and sinks (see above). I’m looking forward to getting my SDCC clone (thanks Ben and David!) hooked up to my radar.